The Stingeries: Gratuler Med Dagen! 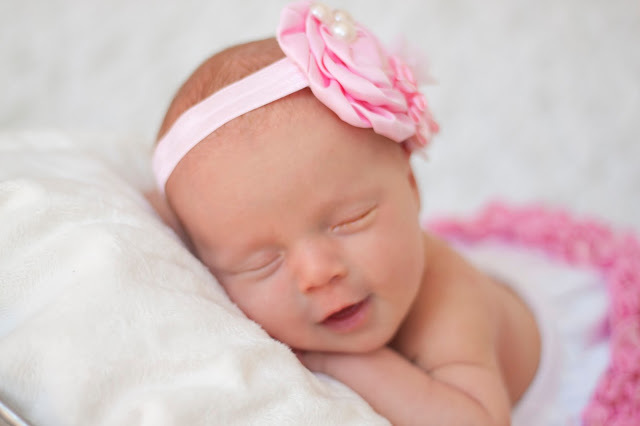 Gratuler med dagen literally means "congratulations with the day". It's used most often for our Happy Birthday but is also heard on other days like today, May 17, which is Norwegian National Day! 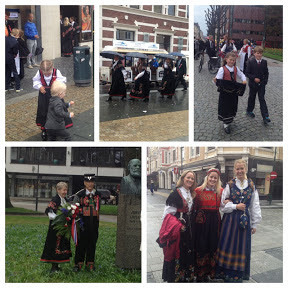 We partook in some of the festivities down in Kristiansand, about 3.5 hours south of Stavanger. We're staying at a cabin in Ålo along the fjord. Check out this amazing view!! 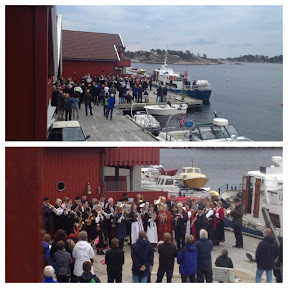 We were warned that we'd be getting an early wake up call this morning with a band playing on the docks. We went back to sleep afterwards and woke up too late to make the Children's Parade. 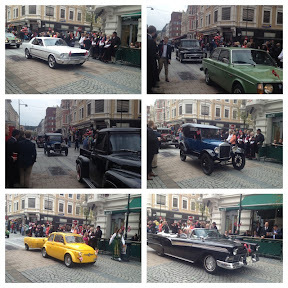 We walked around and enjoyed seeing a Rose Ceremony and Car Parade though. 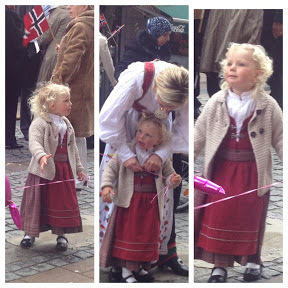 We also loved seeing the the traditional Norwegian attire that's worn today called the bunad. In honor of today, and the fact that we've been here six months now (can you believe it's already been that long?! ), we thought we'd capture some observations we've made about our new home. While some of these might apply to places other than Norway, they are at least all different than what Jason and I are used to in the USA. 1. Do you import a Ford Excursion through a loophole in the system classifying it as a "semi". They have since closed the loophole. 2. Does the tap water temperature get to 160 degrees Fahrenheit. And there's no regulator to adjust that. 3. Do you have two stoplights and 20 roundabouts on the way into the office. 4. Does your work group have a wine pool on Friday afternoon. 5. Does everything close on Sundays except for a few shops that are under a certain size limitation. 6. Do you have to bring your own urine sample to the doctor's office for your appointment. 7. Do you have to purchase tissue paper for gifts at the florist. 8. Do you need a fødselsnummer (basically a social security number) to open a grocery store rewards card. 9. 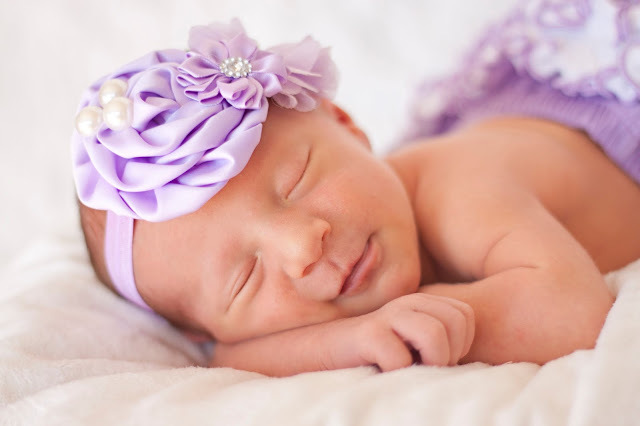 Do you leave your child outside in the stroller for nap time, lunchtime, coffe time, etc. 10. 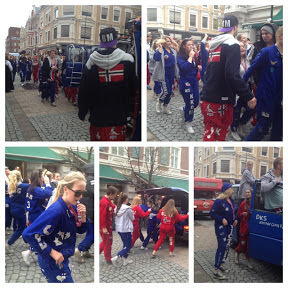 Do you spend almost an entire month partying hard before graduation while wearing blue and red colored overalls and giving one another challenges to accomplish (see russefeiring). We witnessed a multitude of them today in one of the parades. 11. Does the alphabet contain three extra letters that Jason and I still have trouble pronouncing in words!